Perfection is a 21st century disease fanned by the flames of social media. Perfection can cause more anxiety and stress than anything else. Perfection is not a quality to be admired. Perfection can be a time-consuming entity. All three of us at C’est la Vie Wellness have struggled with perfection, not so much in our appearance but more in our work. This has generated a lot of unnecessary stress and tears over the years. Whether it was to produce the perfect school project, the perfect university thesis, the perfect score on a test, or the perfect handouts and programs for clients. There is nothing wrong with aiming to produce good quality work as long as it is within reasonable limits and it does not keep you awake at night. It is a well-known fact that stress is very inflammatory and can lead to a host of diseases. 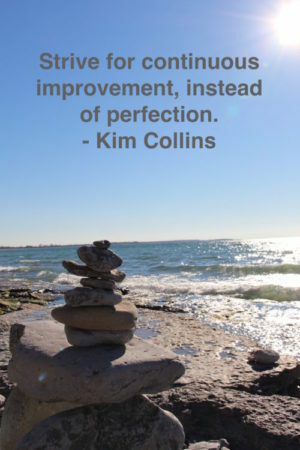 Many of our clients struggle with perfection. They want the perfect body and skin as projected by the media. They want the perfect relationship with their loved ones and friends, again as portrayed by the Entertainment industry. Part of our work is to give them a reality check and to talk about real health goals and real relationships. Real health goals are more about how you feel rather than a number on a scale or a certain dress size. Do you have vitality, energy, strength (in body, mind and spirit)? Are you free of pain, or disease? Those are better indicators of real health. Do not compare yourself to others but be proud of your own journey and of everything you have accomplished. Comparison is the thief of joy! Remember that every body is different. What works for one may not work for the other. The important thing is to aim for a healthy diet and lifestyle that will serve YOU the best. Every healthy change you make along the way brings you closer to optimum health. So put on a smile, add a spring to your step, embrace your imperfections, and enjoy life! Its not about being perfect. Its about who you are. Embrace yourself. Live, laugh, love as only you can. Now that is perfection. That is exactly right Randy. As a new mom trying to figure everything out, I definitely needed this reminder that perfection does not exist and that comparison is counterproductive. Merci! Yes. Comparison is the thief of joy! Enjoy your special moments with your beautiful daughter and be grateful for all that you have. This blog is a keeper and I will share with my teenage daughter. Merci Lyne! Great idea to share with your daughter. A bit of perspective is always a good thing. Knowing that being imperfect is okay really helps. A good reminder Lyne we all can use this information, no matter what our age. I know. We all struggle with perfection and comparaison. Eventually, we must learn to accept ourselves with all our imperfect beautiful parts.